OpenNebula 5.2 ‘Excession’ is Out! 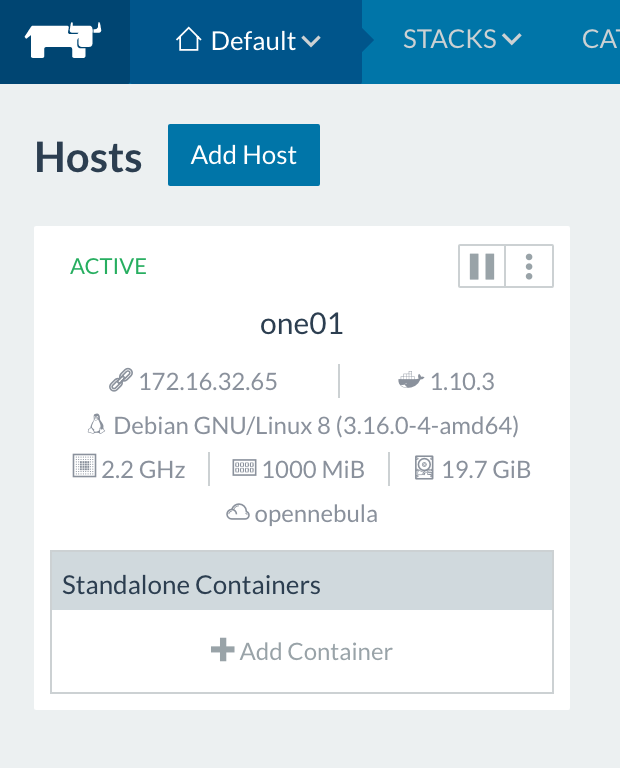 The OpenNebula project is proud to announce the availability of the stable release of OpenNebula 5.2 ‘Excession’. OpenNebula 5.2 (Excession) is the second release of the OpenNebula 5 series. A significant effort has been applied in this release to stabilize features introduced in 5.0 Wizard, while keeping an eye in implementing those features more demanded by the community. As usual almost every component of OpenNebula has been reviewed to target usability and functional improvements, trying to keep API changes to a minimum to avoid disrupting ecosystem components. 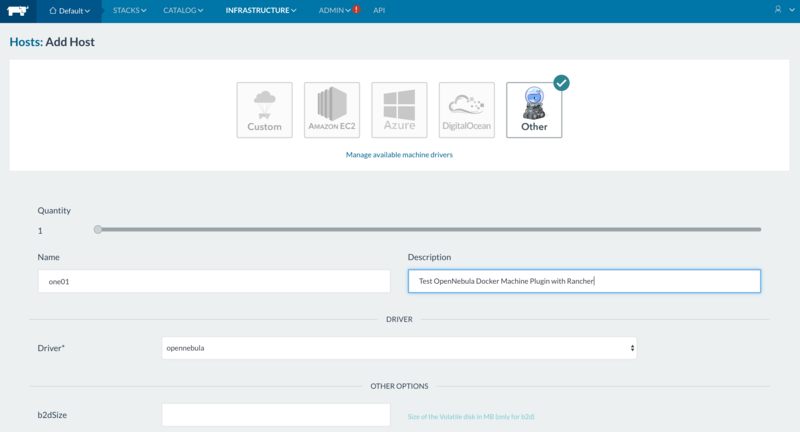 Also, new components have been added to enhance the OpenNebula experience. One important new module is the IPAM subsystem. In order to foster SDN integration, an important step is being able to integrate OpenNebula with existing IPAM modules, in those cases where outsourcing of IP management is required in the datacenter. Fitting in the OpenNebula architecture design principles, the IPAM subsystem interacts with IPAM servers using drivers, and as such a IPAM driver lets you delegate IP lease management to an external component. This way you can coordinate IP use with other virtual or bare metal servers in your datacenter. No default integration is provided, but rather to effectively use an external IPAM you need to develop four action scripts that hook on different points of the IP network/lease life-cycle. Another great addition in Excession is the ability to use group bound tokens. The goal is to be able to use OpenNebula for different projects, which are identified with different groups. For instance, the same user can use OpenNebula for “WebDevelopment” project and a “BioResearch” one, for instance. This user can request a couple of tokens tied to each of these groups. Upon login with the “WebDevelopment” token, she will only be seeing resources from that particular project, and all new resources (VMs, images, networks) will be created within that group, isolating them from the “BioResearch” group. This feature is available both in the CLI and Sunstone, with helpers and dialogs to create, maintain and use the tokens. All the OpenNebula drivers have been improved for robustness. For instance, a new default timeout (which is configurable) has been defined to identify hanging operations and kill crashed processes. In this regard, the EC2 drivers has also been thoroughly revisited, being updated to the v2 of the aws ruby gem, ensuring compatibility with all Amazon EC2 regions. Error handling has been improved as well in the EC2 driver, adding operation retries to circumvent those situations where the EC2 API is not consistent, and adding improved logging. Sunstone is the face of OpenNebula for both administrators and users, and hence a constant target of enhancements to improve usability. Excession brings to the cloud table stabilized features that were introduced in the Wizard maintenance releases, like for instances advanced searches (that now are maintained regardless of tab switching), labels colors and ergonomics, improved vCenter dialogs and import tables (now with feature à la Gmail), hyperlinks to access resources displayed in the info tabs, and many other minor improvements. As with previous releases, it is paramount to the project to help build and maintain robust private, hybrid and public clouds with OpenNebula, fixing reported bugs and improving general usability. This OpenNebula release is named after the Ian M. Banks novel, a recommended read, as well as having a fitting slang meaning, “something so technologically superior that it appears as magic to the viewer.”. We are confident that OpenNebula, if not really appearing as magic, at least solves elegantly your IaaS needs. OpenNebula 5.2 Excession is considered to be a stable release and as such, and update is available in production environments. The group token functionality and dynamic LDAP group mapping into OpenNebula groups were funded by BlackBerry in the context of the Fund a Feature Program. https://opennebula.org/wp-content/uploads/2018/11/opennebula_cloud_logo_white_bg-4.png 0 0 Tino Vazquez https://opennebula.org/wp-content/uploads/2018/11/opennebula_cloud_logo_white_bg-4.png Tino Vazquez2016-10-18 15:32:562016-10-18 15:32:56OpenNebula 5.2 ‘Excession’ is Out! Based in its definition, the “Hybrid Cloud Computing” is a model which combines the use of multiple Cloud services across different deployment models, including combining the use of services of public cloud services private cloud outside or inside organization / institution. Most companies and organizations have not been born in the “cloud”, a situation that often causes the cloud resources are to be connected to traditional systems or applications with some criticality and are usually located in their own premises. This type of architecture is the most common where the keys to their success pass take into account aspects such as integration capabilities, hyper-converged management, etc. Cloud bursting is always welcome! Today we are sharing exciting news about the expansion of the number of public clouds supported by OpenNebula to build hybrid cloud deployments. 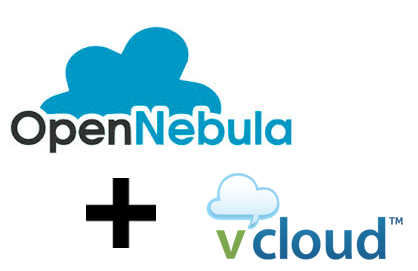 As a result of the collaboration between OpenNebula and CSUC, a new addon to support VCLOUD providers has been added to OpenNebula catalogue. The driver is developed for Opennebula 5.x and VCLOUD 5.5 version and is released today to be available for testing. The integration has been carried out using the ruby_vcloud_sdk, which interacts with the vCloud Director API, enabling a complete control of the lifecycle of Virtual Machines in a transparent way within an OpenNebula cloud. Thanks to these new addon, private resources can be easily supplemented with resources from external providers to meet fluctuating demands. 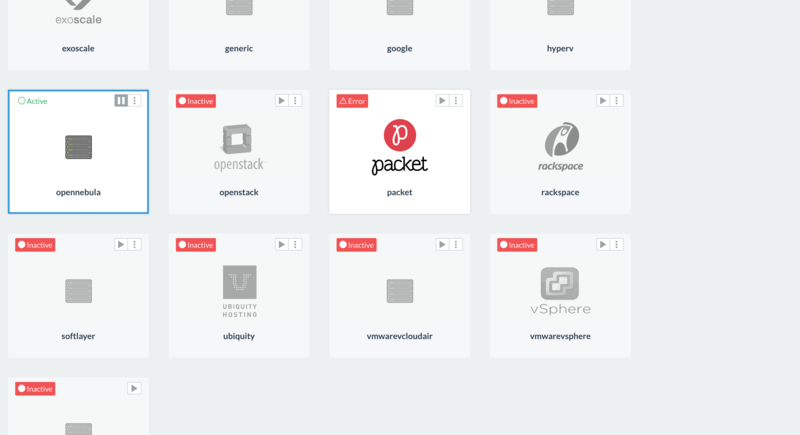 This addon gives Opennebula the posibility to manage resources in VMware vCloud infraestructures. It includes virtualization and monitoring drivers. This driver is based on vCenter Driver and uses a modified version of ruby_vcloud_sdk. Deploy, stop, shutdown, reboot, save, suspend, resume and delete VM’s in the Virtual Data Centers hosted in vCloud. Create, delete and revert snapshots of VM’s. Change RAM and CPU values of VM. It’s able to hot-attach and detach NICs to VM’s. 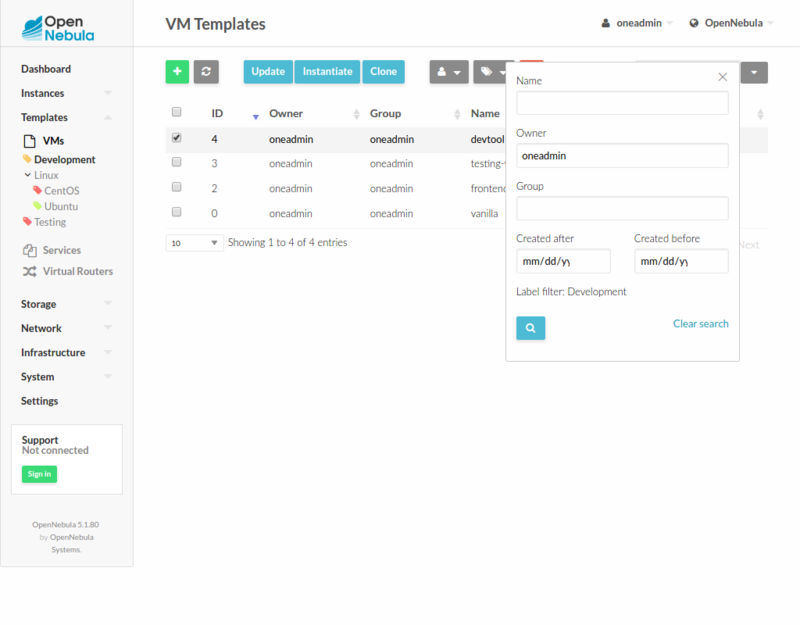 Automatized customization of the VMs instanciated. Obtain monitoring information from the VDC, Datastore and VM’s. In this development version we manage vApps with one VMs inside (A VM in OpenNebula equals a vApp with one VM in vCloud). 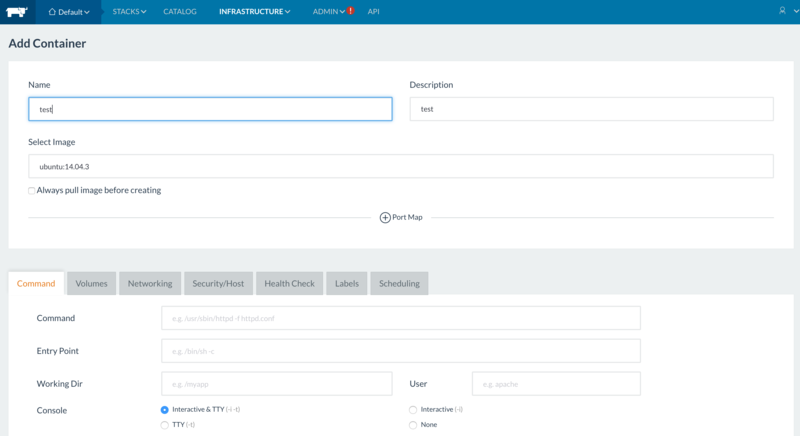 Each Virtual Data Center (VDC) in vCloud is managed as a Host in OpenNebula. Import networks, hosts, templates and datastores hosted in vCloud using onevcloud script. As always, we value your feedback and contributions to this new feature! Rancher is an open source software platform that enables organisations to deploy and manage container-based applications. Rancher supplies the entire software stack needed to manage containers in production using most of the commonly available container orchestration frameworks (Rancher Cattle, Docker Swarm, Kubernetes, Mesos). Rancher has support for Docker Machine-based provisioning making it really easy to create Docker hosts on cloud providers. It creates servers, installs Docker on them, and configures the Docker client to talk to them. Using the Machine integration in Rancher, we can launch compute nodes directly from the Rancher UI. Rancher recently has added support for docker-machine plugins, so it is possible to add Machine Drivers in order to create Docker hosts on any cloud providers. This post will introduce Rancher and show how to launch OpenNebula Virtual Machines from the Rancher UI and provision them to run Docker compute hosts, which can then be used to run Docker containers. In the next steps we are going to install Rancher and use the OpenNebula docker-machine plugin to add virtual machine as hosts to Rancher environments. 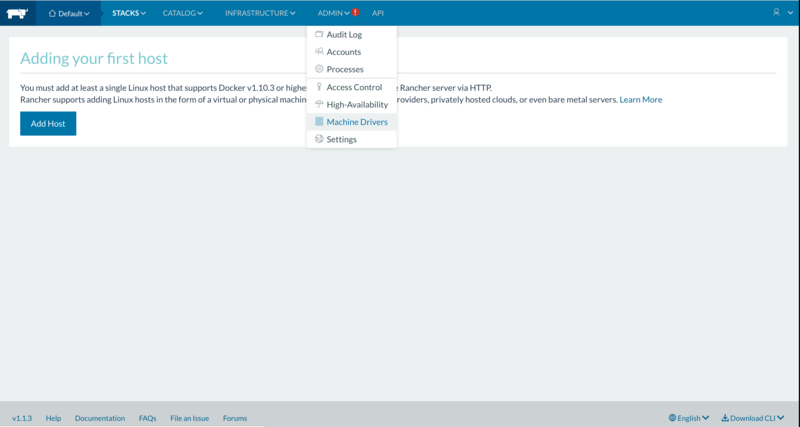 In order to add OpenNebula Virtual Machines as hosts to Rancher we need to add the docker machine plugin binary in the Admin Machine Drivers settings. 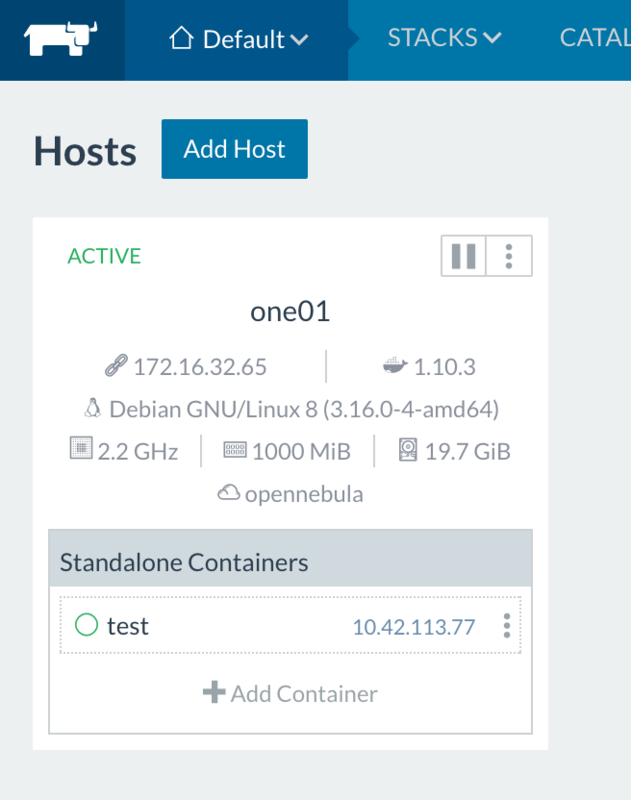 A Linux binary of the OpenNebula machine driver is available at https://github.com/OpenNebula/docker-machine-opennebula/releases/download/release-0.2.0/docker-machine-driver-opennebula.tgz. Once you added the machine driver, a screen with the OpenNebula driver should be active. The first time adding a host, you will see a screen asking you to confirm the IP address your Rancher server is available on, i.e. where the compute nodes will connect. Once you save the settings, you can proceed to create the first Rancher host. and then you can proceed to create the host. After few minutes, when the creation process is complete, you should get a screen with the active host.